Massereene Barracks shooting 2009 – The Despicable & Cowardly murder of two off-duty British soldiers. Lest We Forget! On 7 March 2009, two off-duty British soldiers of 38 Engineer Regiment were shot dead outside Massereene Barracks in Antrim town, Northern Ireland. Two other soldiers and two civilian delivery men were also shot and wounded during the attack. An Irish republican paramilitary group, the Real IRA, claimed responsibility. The shootings were the first British military fatalities in Northern Ireland since 1997. Two days later, the Continuity IRA shot dead a Police Service of Northern Ireland (PSNI) officer; the first Northern Irish police officer to be killed by paramilitaries since 1998. These attacks marked the beginning of the most intensive period of “dissident republican” activity since the start of their campaign. From the late 1960s until the late 1990s, Northern Ireland underwent a conflict known as the Troubles, in which more than 3,500 people were killed. More than 700 of those killed were British military personnel, deployed as part of Operation Banner. The vast majority of these British military personnel were killed by the Provisional Irish Republican Army (IRA), which waged an armed campaign to force the British to negotiate a withdrawal from Northern Ireland. In 1997 the IRA called a final ceasefire and in 1998 the Good Friday Agreement was signed. This is widely seen as marking the end of the conflict. However, breakaway groups opposed to the ceasefire (“dissident Irish republicans“) continued a low-leve armed campaign against the British security forces in Northern Ireland (see Dissident Irish Republican campaign). The main group involved was an IRA splinter group known as the ‘Real’ IRA. In 2007, the British Army formally ended Operation Banner and greatly reduced its presence in Northern Ireland. The low-level ‘dissident republican’ campaign continued. In January 2009, security forces had to defuse a bomb in Castlewellan and in 2008 three separate incidents saw dissident republicans attempt to kill Police Service of Northern Ireland (PSNI) officers in Derry, Castlederg and Dungannon. In all three cases, PSNI officers were seriously wounded. Two of the attacks involved firearms while the other involved an under-car booby-trap bomb. At about 21:40 on the evening of Saturday of 7 March, four off-duty British soldiers of the Royal Engineers walked outside the barracks to receive a pizza delivery from two delivery men. As the exchange was taking place, two masked gunmen in a nearby car (a green Vauxhall Cavalier) opened fire with Romanian AKM automatic rifles. The firing lasted for more than 30 seconds with more than 60 shots being fired. After the initial burst of gunfire, the gunmen walked over to the wounded soldiers lying on the ground and fired again at close range, killing two of them. Those killed were Sappers Mark Quinsey from Birmingham and Patrick Azimkar from London. The other two soldiers and two deliverymen were wounded. The soldiers were wearing desert fatigues and were to be deployed to Afghanistan the next day. A few hours later, the car involved was found abandoned near Randalstown, eight miles from the barracks. Sapper Quinsey was born in Birmingham in 1985 and joined the Army when he was 19. Following his basic training he attended the combat engineer course at Minley before qualifying as an electrician at the Royal School of Military Engineering in Chatham. He served with 38 Engineer Regiment in both Ripon and Northern Ireland and deployed on a number of training exercises throughout the UK. Most recently he attended the intensive class 1 electricians’ course, which he completed with flying colours in 2008. Sapper Quinsey was an outwardly calm, resolute and motivated young soldier. A social live wire and hugely popular across the regiment, he was rarely away from the centre of the action. Professionally his approach reflected his infectious enthusiasm for life. As one of the few soldiers within my regiment to have completed the demanding class 1 electricians’ course his trade skills were invaluable. He was hugely passionate about his trade and eager to put his new qualifications to good use in Afghanistan. We were expecting him to play a vital role maintaining the living and working conditions of British soldiers serving in southern Afghanistan. Tragically he has been denied this opportunity. This has been a traumatic time and the regiment and I are devastated to have lost such a fine and promising soldier. It is with greatest sympathy that I extend my sincere and heartfelt condolences to Mark’s family and friends for their irreplaceable loss. 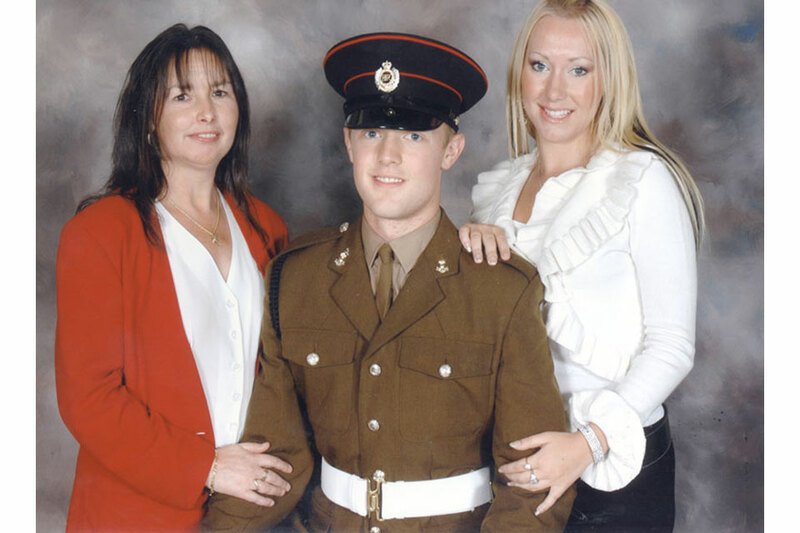 The death of Sapper Quinsey has dealt a heavy blow to the squadron, many of whom have already deployed to Afghanistan. To lose such a charismatic young soldier in the prime of his life has been a tragedy of immeasurable magnitude. I have known Sapper Quinsey for almost two years and in that time have never found him without a positive word or the ability to make light of any situation. His wide circle of friends pays testimony to his popularity. As a soldier he was committed to achieving the best he could in all areas. In particular he was an accomplished tradesman who new that his work could and would make a difference to the daily lives of his friends and comrades on operations. This was always Mark’s motivation. My last and perhaps abiding memory of Sapper Quinsey will be him helping the second-in-command work late to complete the final deployment preparations to send the squadron on operations. It was neither Mark’s role nor responsibility, but he did it and did it well. That was his way; no complaints, just get it done. He will be sorely missed. Our thoughts and deepest sympathies are now with Mark’s family throughout this period and into what will undoubtedly be a difficult time ahead. Sapper Quinsey was a humorous and willing soldier. He had a dry sense of humour and a thick brummie accent making him stand out from the crowd. Unfortunately, I did not have the chance to get to know him as well as I would have hoped as he had recently returned to the troop having completed his electricians’ training. He instantly threw himself back into troop life, both socially and professionally; keen to learn all the skills he needed for our deployment to Afghanistan this summer. In the short time I knew him I enjoyed working with him immensely; he was impossible not to like. I, and the Troop, send our sincere condolences to Sapper Quinsey’s family in Birmingham. If you ever needed a steady hand to crew the ship Mark was your man. He could and would turn his hand to most things. Yet, at the end of the working day, he would always be at the front, immaculate appearance, ready to party and charm the ladies with a bit of his brummie banter. The thing is, he wasn’t just my friend in the Army, he was a friend from back home in Birmingham. It’s hard to believe he won’t be around anymore. He will be sorely missed by me and his comrades around him, within our troop especially. Mark Quinsey was a good friend of mine, I used to share a room with him back at camp and used to weight-train with him now and again. I can’t believe this has happened. My deepest sorrows go out to Mark’s family, he will be greatly missed by all in the Troop and Squadron. My thoughts and condolences go to all the families who have suffered such dreadful losses and to those who have been injured in this appalling incident. The two young Royal Engineers from 19 Light Brigade, although based in Northern Ireland, were about to deploy to Afghanistan for 6 months as part of Task Force Helmand. These brave and dedicated men typify the professional and selfless nature of the Armed Forces. We will cherish their memory. “collaborating with the British by servicing them”. The shootings were the first British military fatalities in Northern Ireland since Lance Bombardier Stephen Restorick was shot dead by the Provisional IRA in February 1997, during the Troubles. The attack came days after a suggestion by Northern Ireland’s police chief, Sir Hugh Orde, that the likelihood of a “terrorist” attack in Northern Ireland was at its highest level for several years. “As long as there is British involvement in Ireland, these attacks will continue”. The morning after the attack, worshippers came out of St Comgall’s Church after mass and kept vigil near the barracks. They were joined by their priest and clerics from the town’s other churches. On 11 March 2009, thousands of people attended silent protests against the killings at several venues in Northern Ireland. First Minister Peter Robinson suggested that the shooting was a “terrible reminder of the events of the past” and that “These murders were a futile act by those who command no public support and have no prospect of success in their campaign. It will not succeed”. Deputy First Minister Martin McGuinness said “I was a member of the IRA, but that war is over now. The people responsible for last night’s incident are clearly signalling that they want to resume or restart that war. Well, I deny their right to do that.” He later stated that the shooters of the PSNI officer killed two days later were “traitors to the island of Ireland”. Sinn Féin President Gerry Adams condemned the shootings, saying that those responsible had “no support, no strategy to achieve a United Ireland. Their intention is to bring British soldiers back onto the streets. They want to destroy the progress of recent times and to plunge Ireland back into conflict. Irish republicans and democrats have a duty to oppose this and to defend the peace process”. 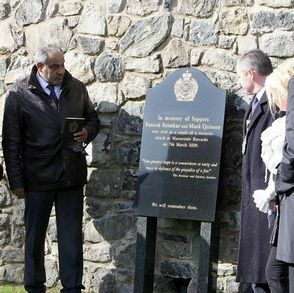 British Prime Minister Gordon Brown visited the scene of the attack on 9 March 2009 and met political leaders in Northern Ireland to urge a united front in the face of the violence. He stated that “The whole country is shocked and outraged at the evil and cowardly attacks on soldiers serving their country” and also that “No murderer will be able to derail a peace process that has the support of the great majority of Northern Ireland”. Taoiseach Brian Cowen said “A tiny group of evil people can not and will not undermine the will of the people of Ireland to live in peace together. Violence has been utterly rejected by the people of this island, both North and South”. At a press conference on 25 March 2009, Richard Walsh, the spokesman for Republican Sinn Féin, a party linked to the Continuity IRA, said the killings were “an act of war” rather than murder. “We have always upheld the right of the Irish people to use any level of controlled and disciplined force to drive the British out of Ireland. We make no apology for that”. He also described the PSNI as “an armed adjunct of the British Army”. 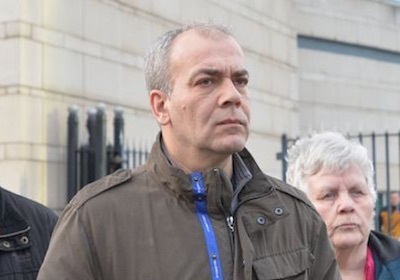 On 14 March 2009, the PSNI arrested three men in connection with the killings, one of whom was former IRA prisoner Colin Duffy. He had broken away from mainstream republicanism and criticised Sinn Féin‘s decision to back the new PSNI. On 25 March 2009, after a judicial review of their detention, all the men were ordered to be released by the Belfast High Court, however, Duffy was immediately re-arrested on suspicion of murder. On 26 March 2009, Duffy was formally charged with the murder of the two soldiers and the attempted murder of five other people. The following day he appeared in court for indictment and was remanded in custody to await trial after it was alleged that his full DNA profile was found on a latex glove inside the vehicle used by the gunmen. Brian Shivers, a cystic fibrosis sufferer, was charged with the soldiers’ murders and the attempted murder of six other people. He was also charged with possession of firearms and ammunition with intent to endanger life. He was arrested in Magherafelt in July 2009. In January 2012 Shivers was convicted of the soldiers’ murders, but Duffy was acquitted. In January 2013, Shivers’s conviction was overturned by Northern Ireland’s highest appeals court. A May 2013 retrial found Shivers not guilty. He was cleared of all charges and immediately released from jail. The judge questioned why the Real IRA would choose Shivers as the gunman, with his cystic fibrosis and his engagement to a Protestant woman. Brian Shivers has suffered the horror of having been wrongfully convicted in what now must be described as a miscarriage of justice. He was convicted of the most serious charges on the criminal calendar. He was sentenced to a life term imprisonment, which would have seen him die in prison. The original conviction was overturned on a narrow legal basis. It was only during his re-trial that important new material was disclosed which completely undermined the case against him. This failed prosecution – another failed prosecution – is a cautionary tale against the reliance upon tenuous scientific evidence in high profile criminal cases. The mother of a young soldier who was gunned down by dissident republicans will today make an emotional return to the spot where he was murdered. 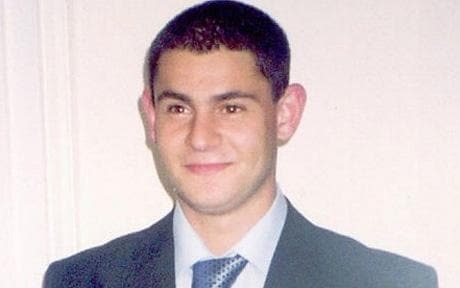 Geraldine Ferguson, whose son, Sapper Patrick Azimkar (21) was killed outside Massereene Barracks on March 7, 2009, along with his colleague Sapper Mark Quinsey (23), will mark the eighth anniversary of her son’s death with a floral tribute. The anniversary comes days after she spoke of the loss of her son at a seminar in Co Fermanagh, attended by other victims of paramilitary violence. Today, Mrs Ferguson will make the heartbreaking journey to Antrim, to the spot where Patrick was killed. “We will lay some flowers and then go to the memorial that Antrim council erected for Patrick and Mark,” she said. “We will try and get through the day, but it is very difficult. “The main feeling I will have is being absolutely broken-hearted. Mrs Ferguson explained that as the years go on, her emotions are not as raw but admits she finds it hard to describe the pain of losing her son. “The horror and heartache is too deep for words,” she said. “A very common experience when you lose a child is that the days that were once the best days suddenly become the worst days, including birthdays, Christmas, Easter and Mother’s Day. They are supposed to be family days but he’s not there any more. Three people were arrested over the murders of Mr Azimkar and his colleague Mr Quinsey, whose grief-stricken mother Pamela Brankin died in 2013 aged 51.